Elisa touch. 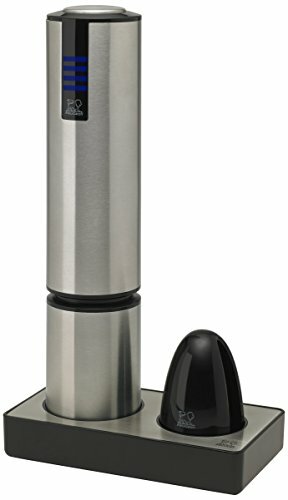 New generation electric corkscrew. Tall and elegant, this corkscrew in brushed stainless finish is a concentration of State of the art technology. This slender corkscrew is a little Marvel of technology. Its onboard rechargeable means no cumbersome, unsightly wires get in the way as it gently extracts all kinds of corks with an automatic start and stop. Complete with capsule-cutter, silent but powerful motor and LED charging light. A new-generation accessory that makes life simpler - soon to be an essential for all lovers of good wine. Automatic triggering. Functions automatically by pressing on the cork. Removes all cork types smoothly. Recharging base. LED charging indicator.